With approximately 263 million vehicles on the road, the United States is a country made up of drivers that trust their vehicles to get them everywhere as safely, reliably, and efficiently as possible. However, there’s a good chance a vast majority of these drivers may not know they’re unknowingly sacrificing safety, wasting money and time, and unnecessarily harming the environment along the way. Enter Driving2Save.com, a Santa Barbara-based online startup offering a comprehensive and innovative online resource dedicated to educating consumers about driving, with entertaining and valuable content that will enable them to save lives, money, time and the planet every time they get behind the wheel. Driving2Save’s mission is to build a brighter future by serving as trusted advisors to conscientious drivers everywhere. 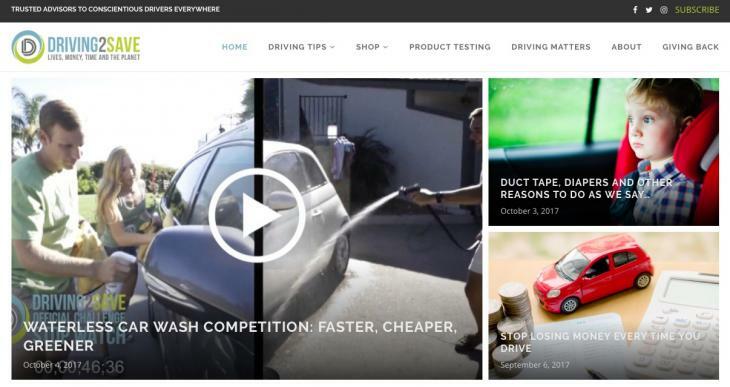 Driving2Save is an online resource that shares everything from driving tips and educational ma-terials for drivers, to consumer product testing and scientific reports, to an online marketplace offering au-tomotive products and technology they’ve identified to be the best out there. Driving2Save’s scientists stay on top the latest developments in automotive technology, do the research, run real-world tests and crunch the numbers so consumers can “drive to save” by making easy changes to their driving style and buying the best gear at the best prices. All of Driving2Save’s test results, resources and edu-cational content on their site are free of charge for consumers. “We want to make it as easy as possible for people to drive to save,” said Goebel. Visitors to the site will find the “Driving Tips” pages handy, covering everything from maintaining tire pres-sure to maximizing the miles per charge on electric vehicles. The “Product Testing” page is where interested consumers can access results from of hundreds of hours and thousands of miles of rigorous testing and re-ports. Consumers looking to upgrade their gear and get a strong return on their investment will appreciate the “Shop” section, where they can purchase a curated selection of items the Driving2Save experts have tried, tested, and identified to be the best on the market. Driving2Save aims to transform the driving experience into a positive one that is enjoyable and contributes to a brighter future. They encourage the public to visit their Site, pledge to follow one or more of their tips, and join the Driving2Save community. To learn more visit Driving2Save.com. Driving2Save, a Santa Barbara-based company established in 2017, is dedicated to building a brighter future by empowering a community of drivers to save lives, money, time and the planet each time they get behind the wheel. Driving2Save was founded by Brian Goebel, who, after a random “low tire pressure” reading in his car, turned his unanswered questions into a multifaceted online informational center through dedicated scientific, market, and product research and extensive testing. Driving2Save cares about tomorrow’s drivers as well, and contributes 2% of profits each year to charities that work to create a brighter future for children. Driving2Save is committed to providing users with the latest, most effective driving methods. To learn more visit www.Driving2Save.com.